This is the smallest verse in Scrupture, and yet it is a powerful one. Thoughts and meditation on this verse can go so many directions. Two initial thoughts come to mind. The first is the obvious and primary application. This is that Jesus can be touched with our infirmities, and is willing to bear our grief. He loves and is compassionate. Thank God for this in our times of sorrow. The second thought is that, though Jesus was a man’s man – as a carpenter, as a man with a self-made scourge to drive out men from the temple, as a man who was willing to live ruggedly with no pillow, as a man who called the rich and influential adulterers and full of junk, and much more – He was also a man who wept. When He came to Jerusalem and saw how hard their heart was and of the coming destruction of e city, He wept. In the Garden, He wept. At Lazarus’s Grave, He wept. 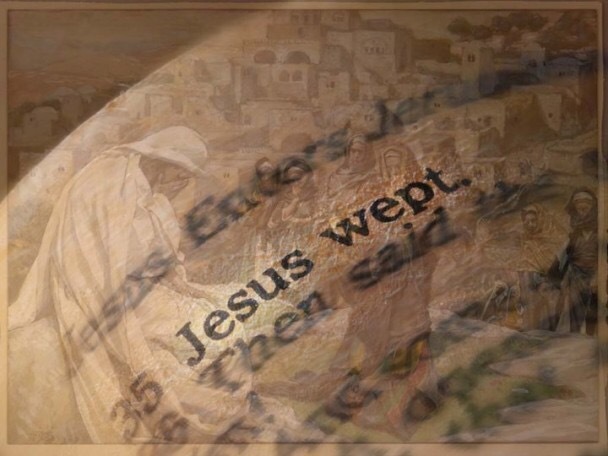 Many times Scripture records Jesus’ weeping. This reminds me of the song, “Lord, let us weep again.” I’ve found that it’s when my heart gets a little calloused that I have a hard time weeping. But when it’s in tune with the Lord’s, we can weep over “our city”, or people that are hurting, over sin, or the lost, or over things that break our or God’s heart. Maybe a heart check is in order to ask, when was the last time I wept over one of these things? After all, the greatest Man did oft times.